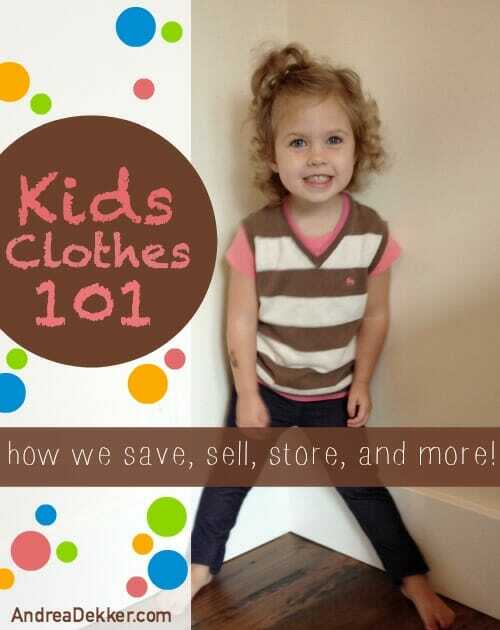 Kids Clothes 101: How we save, sell, store, and more! I can’t do a full week of clothes clutter posts without dedicating one (LONG) post to kids clothes. Yes, their clothes are small — but boy can they quickly get out of control and consume massive amounts of storage space in our homes if we don’t have some sort of system in place. In my opinion, it’s always more difficult to weed through kids clothing than my own because everything is just so cute! Plus there are sentimental ties to many items, the “but it was a gift” guilt, the “but I paid good money for them and they are still in perfect condition” excuse, and let’s not forget about the “but what if we have another baby” factor. All of these things piled on top of the fact that kids never stop growing and grandparents never stop gifting us more clothes can make it very challenging to stay on top of all our kids clothing. Before we get too far into this post, I have to admit that I don’t have all the answers. I have worked with many different families over the years (with many different aged children) and of course, I have personal experience with the 3-and-under crowd… but there is no way I could possibly be able to address every single kids clothing question I’ve ever received. 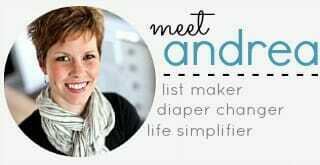 My plan is to touch on the main issues I see in most homes, talk about how we handle our kids’ clothing, and link to some previous posts I’ve written on this subject. As always, I welcome any and all feedback or other creative ideas in the comments below! 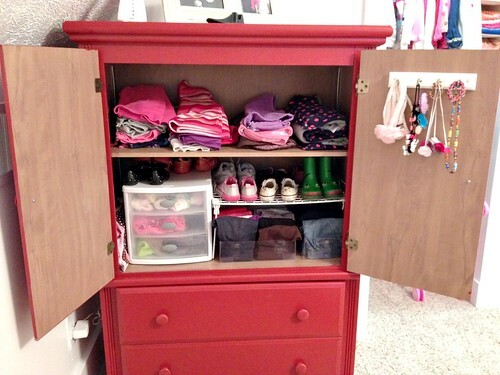 How do you organize your kids’ closets? I talk more specifically about how I organize Simon’s nursery closet here. And this is the post about how I organize all of Nora’s toddler clothes. Neither one of our kids have an overly large closet — just one 3-ft. hanging rod and a couple shelves for each child. There is room to add an additional rod if they ever have more hanging clothes or if they end up sharing a room, but for now, this is plenty for us. I actually really like having smaller closets for them because it helps to assure I don’t amass too much clothing for one particular size range — because after all, how many clothes do they really need when they grow out of them faster than they can wear them!? I think for me, the important factor in keeping our closets decluttered and stocked with items that actually fit is simply a tiny bit of monthly maintenance. I have a bin in each closet for out-grown items and anytime I notice something is getting too small, I toss it in that bin. It’s still in the closet, but out of sight (so I don’t keep grabbing it for them to wear) and I don’t need to actually DO anything else with it just yet. As long as it’s out of their normal clothing rotation, I’m happy with that (keep reading below for how I deal with that bin of out-grown clothes). I also have another bin (or drawer) of too-big clothes that I flip through every few weeks for Simon and every new season for Nora. You know as well as I do that just because the tag says one size doesn’t mean it will necessarily fit the same as another shirt with the same size. So, I’m always weeding through the too-big clothes for new items that fit or will fit very soon, and replacing the out-grown items I tossed earlier (again, keep reading below for how I handle our too-big clothes). How do you save and store out-grown clothes? Well, I don’t want to ruffle too many feathers, but for the most part, I don’t save a lot of my kid’s clothing (at least not sizes 3 mo. — 2T). I’ve seen time and time and time again where none of the children are able to wear each other’s baby clothes because they are opposite gender, born in opposite seasons, or just have growth spurts at opposite times of the year. I do save a bunch of newborn – 6 mo. sleepers and onesies as all babies can use those no matter what. I also save the tiny white socks and baby slippers because they never get worn out. After that, I save a couple of my favorite outfits for each gender and size and that’s it. 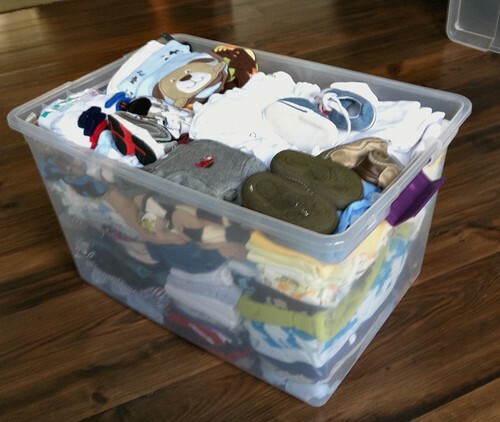 You can read more in-depth about why I’ve chosen not to save and store so many baby clothes here (it is a very conscious decision even though I realize it’s not the best choice for everyone). The clothing that I DO store get’s put in a large plastic tub with a tight-fitting lid (one for girl’s clothing and one for boys) in our upstairs storage closet. Every few months (or whenever the bins of out-grown clothes in the kid’s closets are full), I weed through those clothes, donate anything I don’t love, and pack the few outfits I want to save in the tubs. So far, I have one tub of girls size newborn – 2T and just a few items on the bottom of a tub for Simon. But what if you have more kids? I know, I know — this is the MOST common response I hear when I say that I’ve donated many of our baby clothes. Babies and toddlers really don’t need that many clothes as long as I do the laundry regularly… not to mention I can find such good deals on kids clothing (either through ThredUp like I talked about yesterday, borrowing from friends, or good old-fashioned yard sales) that it really doesn’t pay to take up valuable storage space with all those clothes. I know it’s difficult to purge those baby things (it’s not always easy for me either) but as with most things I’ve purged, I have not regretted it later. About a month ago, a neighbor asked if she could borrow some of Nora’s 6 month summer outfits because they were going to Florida in the middle of winter (when her baby would be 6 months old). I willingly gave her the few outfits we had, but as I was going through our single bin of girl’s clothing, I realized that I really wasn’t that excited about those “favorite” outfits I had been saving for the past 2+ years. Yes, I thought they were super cute at the time, but now I noticed a couple light stains, how worn they actually looked (I got them all used), and that I really didn’t love them as much as I thought I did. Even if I would have another girl in the Fall or Winter, I know I’m going to love finding a few new-to-us outfits for her instead of the old stuff that has been packed away for many years. Not to mention, someone else will be enjoying all my baby things for all those years they would otherwise be packed away in my house. When would you ever hang onto baby items? For starters, please don’t feel like you need to do everything just like me — however, since I’m often asked this question, here are a few criteria I have for keeping various articles of kid’s clothing. 1. If I really really love it and it still in fabulous condition. 2. If it was a special outfit passed down to us. We currently have 3-5 clothing items that have been passed down from Dave and from me to our children. They really aren’t everyday clothes, but it’s been fun to dress them up every once in a while to see if they look like Mom or Dad. We won’t get rid of these — but at the same time, if we start accumulating more and more sentimental items from our parents (which I don’t think will happen) we will probably need to make more decisions at that point. 3. If we have another child who actually will be able to use hand-me-downs. For example, if we have another girl in the Fall, then I will most likely start saving a bit more of Nora’s clothes because there’s a good chance they will eventually fit the new child. Same thing if we ever had another boy in the spring — I would start saving more of Simon’s clothing at that point. 4. If we ever feel like we have more storage space then we do money to spend on clothing. Since we live in an old farmhouse, we don’t have a ton of extra storage closets. 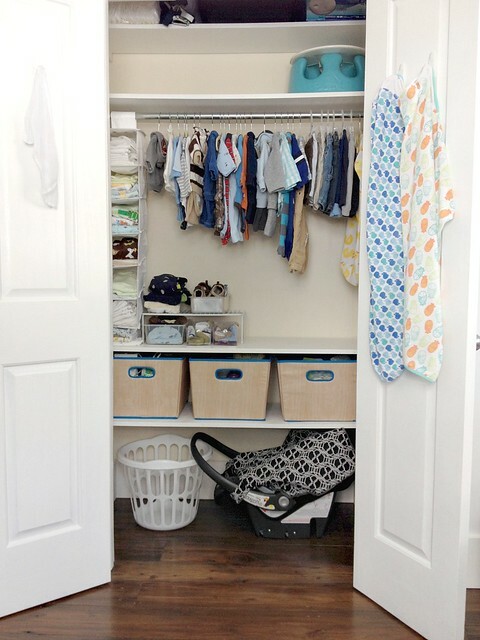 I don’t like storing anything clothing in the basement or garage and I refuse to take over our extra bedroom closet storing baby clothes (just my own rule)! So if it doesn’t fit in their own rooms or in my one-storage-tub-per-child, then we need to get rid of it. I know I can find extremely frugal clothes for new children if the need ever arises. However, if we do ever get to a point where we have more storage space (like we finish off the basement) or our financial situation is different and we might not be able to afford more clothing for future kids, I would reevaluate this entire topic. If it doesn’t meet any of those 4 self-imposed rules, then I’m probably not going to save it. What do you do with the clothing you get rid of? What about sentimental and special outfits? 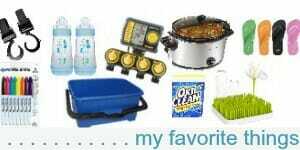 We don’t have many items that fall into this category (yet) but right now, I simply have a small space-saver bag with these items and I store that bag next to the 2 bins of outgrown clothing. Eventually, if we amass more sentimental items, I would consider making a quilt with the various fabrics — but I’m not nearly to that point yet! Another idea would be to take photos of the special outfits and then make a nice photo collage or album. This way, you don’t need to feel as bad about purging at least some of the clothes. How do you save and store clothing that’s too big? Over the years, we have been gifted some hand-me-down clothing from friends and relatives with older children. When this happens, I quickly look through everything ASAP and sort out the items I’d like to keep. Then I ask the person if they would like the rest of the clothing back or if they would prefer I share it with someone else and/or donate it myself. I try not to keep more than a handful of outfits for each size (at least when they are babies and toddlers) because in my experience, trying to stock up too far ahead never works. It’s really hard to predict what size your baby will be at certain times of the year — and you could easily end up wasting time, space, and money trying to stock up too far in advance. Even for Simon, I tried to stock up on 0-6 months clothes before he was born… and it turns out he was huge and was wearing 6 month sizes at only 2-3 months old. All his 6 months clothes were for summer — so you can imagine this didn’t work out that well for late April and May. Now that he’s 6 months old, I’m already putting him in mostly 12-18 months summer and fall clothes, so it wouldn’t have done me any good to stock up so far in advance. That said, here is how we handle the too-big clothes we do keep. 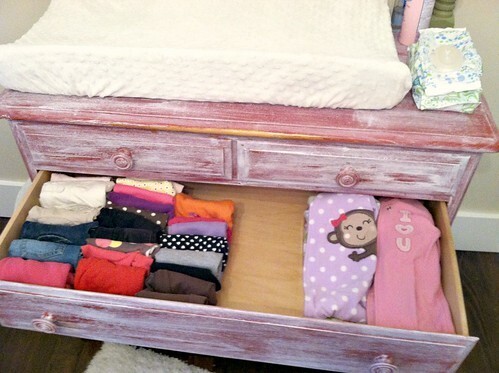 I’ve tried a few different methods in the past, but currently, I have a drawer in each child’s dressers that store their too-blog clothes. When the drawer is full, I stop accumulating more (even if it’s free). Another way I’ve been able to cut back on storing too many bigger items is by only collecting every other size. So I might get 3 month clothing and 9 month clothing but skip 6 month clothing. The baby can wear the 3 month stuff until it’s a little snug and then switch to the 9 month clothing even though it might be a bit big. In those tiny baby stages, there really isn’t a huge difference between 3 month and 6 month stuff, or 6 month and 9 month — so by skipping the 6 month stage, I need less clothing. Obviously this doesn’t work perfectly (especially as they get older) but is has definitely helped me to reduce the amount of storage space I need for the too big clothes. 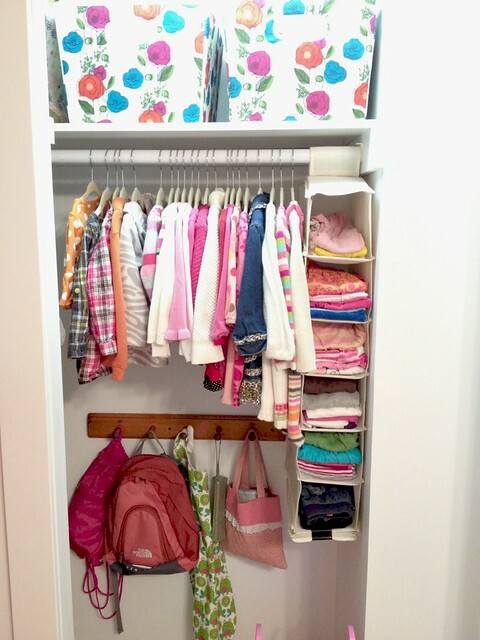 Nora’s current closet and clothes storage. Simon’s current closet and clothes storage. 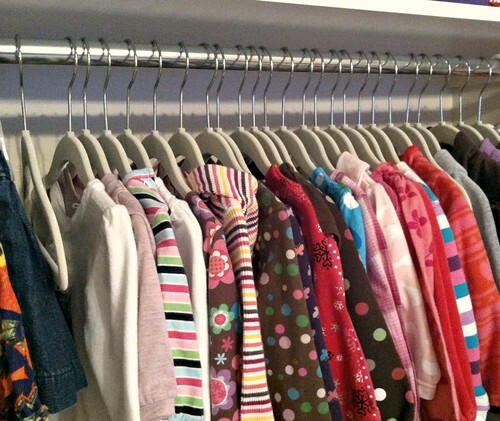 4 reasons I purged almost all our baby clothes. How I store and organize all our baby clothes. Tips to get your kids involved in the organizing process. A way to handle the well-meaning relatives who continually gift your children with more clothes and stuff! Ok, I think that’s it for now. What did I miss? What other questions (or ideas) do you have? Weekend Giveaway: Custom "Daddy Quilt"
Great!!!!! post! Thank you so much, just what I needed. Yes Tara, Nora actually wore all her summer clothing from last year again this year. Last summer, she was in diapers so everything was bulkier. This summer, with no diapers, everything still fit. Plus, with shorts, skirts, and capris, it didn’t matter that she’s grown about 6″ !! My kiddos are 4 yrs apart and different genders but I don’t think I would save any more clothes if that wasn’t the case. In my experience you get way too much given to you and they are constantly coming out with cuter stuff, so why save the old! I have not spent more than $300 in clothes for them and they are 9 & 13! 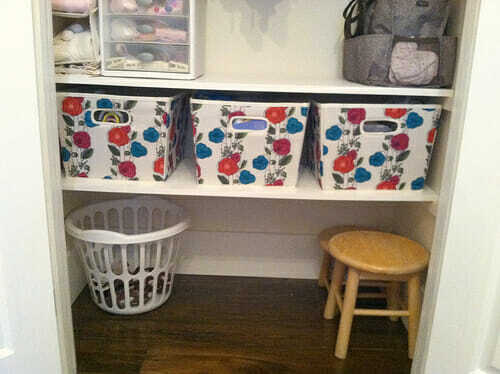 Love the idea of a purge bin right in the closet! I will be implementing that tip. wow, that’s awesome Mary. I’m honestly guessing that I’ve spent less than $75 on clothing for both kids so far — and I don’t anticipate spending much more over the next few years. For me, keeping my clothing expenses down makes it MUCH easier to purge the clothing later. What I have noticed about raising two boys is that by the time the second son is wearing the hand me down shirt I am tired of seeing it! I sell to Once Upon a Child and then donate the rest (what they don’t want) to charity. Pants usually go to a thrift store as the knees are worn out. yeah — I feel the same way and I haven’t even had 2 of the same gender. I have such few clothing items per size that I honestly get sick of dressing them in the same things over and over and over again. I’m ready to get rid of them and move on when they outgrow items. I don’t feel bad because I always buy used (or borrow) and we wear everything A LOT. Less to wash, less to store, less to buy… it just works for us! Huh, it’s funny how viewpoints on even small things can be so different! I am certainly sick of looking at a piece of clothing when the first child is done wearing it, but I always take great delight in wearing it on the second child when it’s time. I remember fun occasions or how cute the first looked in it or whatever. to each their own… right Becky! For me, I’d rather just purge and be done — which so far is working really well for me considering I have opposite genders born in completely opposite seasons! No kids here, but seriously will be applying the bin idea for clothes that are going-out-the door. I haven’t started purging since I want to set a full day to go through the closet. However, I have an empty bin in our closet that I can definitely use to collect purged items as I weed through clothes daily looking for things to wear. Hey Debbie, just a suggestion — there is absolutely no need to set a full day aside to go through your closet (because if you’re like most people, you’ll never have a full day and you’ll just keep putting it off). Instead, start TODAY! Even if you simply purge 2 or 3 things you know you don’t want, that’s a start — and it will motivate you to purge 2 or 3 more things tomorrow, or next week, or whenever you have 5 minutes to put towards your closet. A full day of closet purging even sounds overwhelming to me and I LOVE closet purging. Just do a little at a time and it will eventually be finished with little to no extra effort on your part! Totally gonna do it! I think having an empty bin in our closet will help a lot for me to start NOW. I really don’t mind setting aside a full day to do it. I’ve got it all planned out when to start, and actually looking forward to it. It will really feel good to get it done. Thanks Andrea! Ok good!! have fun and good luck! Love the idea about buying every other size in infant clothing. I really struggle with figuring out where the line is between enough and too much. Would love to see a breakdown of how many of everything you have, especially in toddler sizes. Really enjoyed seeing how you did this with your own clothing–it encouraged me to finally let go of a few things! Thanks Jaime — glad to help. And yes, the idea of buying every other size has been a HUGE help for me when it comes to infnat clothing especially! In general, I will almost always say “less is best” with baby clothing. We have about 2 sleepers in each size, 5 or 6 onesies per size, 2 or 3 pants, and maybe 1 or 2 cuter outfits per size. But remember, I don’t get out very often so I don’t care if they just wear sleepers and onesies. I also do laundry a lot, so I can get away with less clothing. 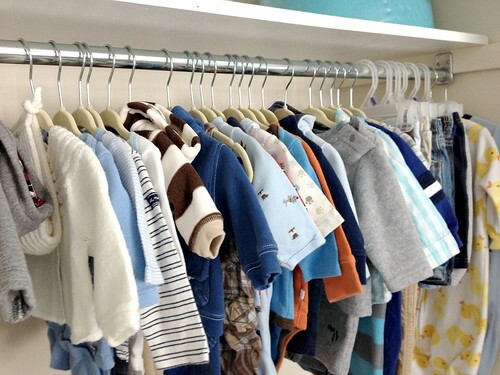 I recently started buying and selling baby/kids clothes at Once Upon A Child (we have four kids, 8, 6, 2, and 4 months). I love that they give you cash on the spot for your items. I have gotten some great deals on infant clothes as, like you said, they go through them so quickly. I have an easier time purging items when I can quickly sell (or donate if they don’t sell) them for cash, then turn around and buy the next size I need. 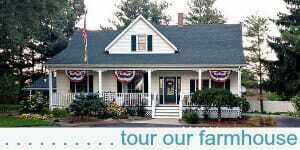 We live in an old farmhouse as well and have limited storage space so I definitely need to purge more. 🙂 Great post!! Thanks Emily — good to know Once Upon A Child gives cash upfront. We have one of those stores about 20 minutes from me but I didn’t know if it would be worth the drive. I might try it out in the future. Thanks! I think I have it easier here in southern California, where it’s basically the same weather all year long so I don’t have to worry about winter vs. summer clothes. I store one bin per year (NB through 12 months, for example), and so far it’s worked well as we’ve had 3 girls in the last 5 years. I don’t own any boy clothes. I store all too-big items in one closet, all hung up, so I can keep track visually of what they have. Thanks for another great post, Andrea! well, maybe a little easier — although I’m a big fan of layers so we’ll wear short sleeves all year long but just put a sweat or sweatshirt over top in the winter. I’m sure us “colder states” do need more clothing that CA, but it is possible to still keep our clothing under control with layers. Oh, and I also keep some of the “just a little bit too big” items hung up in the closet as well — otherwise (like you) i might forget about them if I don’t see them hanging there!